Blind rivets are used where the rivet is not accessible from both sides. They have an integral mandrel that permits the formation of an upset on the blind end of the rivet. As the mandrel is pulled into or against the body being riveted it breaks at or near the intersection of the mandrel shank and its upset end. 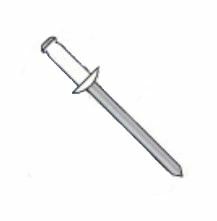 Blind rivets are frequently used as an alternative to solid rivets.